When we, photographers, set our minds on one image it’s all too easy to forget about what’s happening around us. We have this magical scene in front of us, the light is changing fast, the heart is pumping with excitement so no wonder it can slip from our minds that there may be another magic happening behind our backs. In my case, I can get too concentrated on my photograph in front of me, that I don’t pay enough attention to what’s happening behind me…but I’ve learned this lesson number of times and am now much more careful not to miss an opportunity for some other photograph then to what I set my mind on. Saying that though, I still do think that concentration on making a photograph you came for should be priority, as I’ve also experienced this in a hard way, that if we want too much, we often end up with average, missing on the best moment on the intended image. This photograph of kayak perfectly reflecting in sheets of gold light on a still Okarito Lagoon on the West Coast in New Zealand is a perfect example of an opportunity when you got your main frame in a bag and are hungry for more! This entry was posted on 29/10/2013. 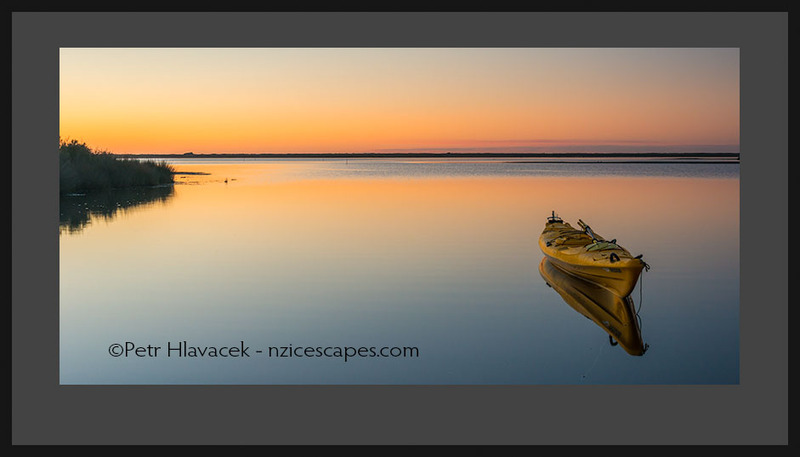 It was filed under Coastal, Photography and was tagged with coastal, colour, kayaking, New Zealand, photography, sunset, West Coast, Westland NP.